For those of you continually looking to improve your physical well-being and expand spiritually, near infrared saunas can be a wonderful addition to your personal program. While saunas have always been an aid to physical and spiritual development, near infrared saunas truly enhance the traditional sauna effects and give you the maximum therapeutic potential for body, mind and spirit. On each level, physical, emotional, and spiritual, near infrared sauna therapy will help aid your development. What exactly is a Near Infrared Sauna? 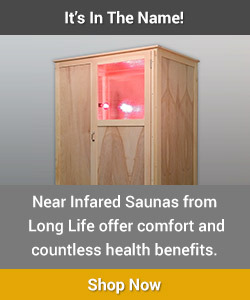 A near infrared sauna is an indoor electric sauna that uses near infrared heat lamps for heat. Unlike its cousin, the far infrared sauna, near infrared saunas use a range of light energy having profound healing and regenerative effects at the cellular level. Natural sunlight is 37% near infrared wavelengths and our bodies have evolved a photosynthetic like response to this range of light. These specific wavelengths enhance cell metabolism and the production of key structural proteins. Near infrared light penetrates deeply and easily into the body where it enhances physical function and cellular regeneration. The saunas also provide an effective and genuine light therapy with the colors red, orange and yellow. Combining this type of light therapy with sauna heat has created a unique and wonderful healing tool that will give you deep and lasting results. Saunas have traditionally been used for ritual purification. Today, we need this more than ever as our bodies are so polluted with heavy metals and toxic chemicals prevalent in the air, water and food. Near infrared saunas are dry, with no steam, to promote the most intense sweating and detoxification. Detoxification through sweating spares the liver and kidneys because all manner of toxins are just passed through the skin. There is no enzymatic conversion by the liver and no filtering by the kidneys. Its detoxification, pure and simple, and it’s absolutely crucial for physical health in today’s world. The powerful combination of light and heat can help heal virtually any physical health condition. Near infrared sauna use yields anti-inflammatory pain relief, cardio conditioning, enhanced circulation, lowered blood pressure, anti-aging skin regeneration, increased energy levels, improved immune function and improved muscle tone. We must not overlook the importance of a strong physical body on our spiritual journey. Even though we are spiritual beings, it is extremely difficult to do our healing work in the physical world if our own bodies are ill or weak. Emotional balance is also essential to our spiritual development. It’s tough to act compassionate and loving to other when we ourselves are feeling anger or fear. A near infrared sauna offers unique help. Regular use is a powerful stimulant to circulation. Physically, the light wavelengths enhance the production of nitric oxide which expands and dilates blood vessels. Our natural response to heat is to further enhance circulation as a means to dissipate heat at the skin surface. Regular use improves cardiac function and powerfully decongests the internal organs, especially the kidneys and liver, all while toning the heart. Any internal congestion in these organs can create disruptive emotions. In Chinese medicine the kidneys rule fear, the liver rules anger, and the heart is the home of a calm spirit. Keeping the energy free flowing through these organ systems helps maintain emotional harmony. Even more important to our development, is that a physical clearing of these organs greatly assists our cells in releasing stored emotional toxins. Deeply held emotional hurts and traumas manifest over time into physical diseases. Their resolution takes great courage and hard work. A near infrared sauna can assist you on this process in so many ways. Total detoxification and enhancements in internal circulation will help all these processes move more smoothly. The sauna heat lamps also supply light therapy in the colors red, orange and yellow. These wavelengths help purify the emotional body while exerting a grounding, stabilizing effect on the lower energy centers. All of these benefits combine to aid in your spiritual development. Of course, purification has traditionally been a part of spiritual practices. In modern times, the need is ever greater. The toxic soup of environmental contaminants we live hinders human development, awareness and growing consciousness. When we sweat it out in the sauna, we get physical healing, it helps our emotional healing and makes it easier to grow spiritually. Above and beyond, near infrared sauna use is a gift we give ourselves. It is time out of every day to sit quietly and relax. It is an opportunity for and an action of self-care and self-love. It is gentle yet powerful, relaxing yet energizing, both restorative and transformative. It reminds us that in order to share our gifts with the world, we must first care for ourselves. As we seek to fulfill our spiritual mission in the physical world, let us remember that the stronger our body, the more able we are to give to others.